This article, written in the 1980s, is reproduced here with the kind permission of Derek O’Dell, Editor and Producer of ‘The Southern Ex-Boxer’. Professional boxing isn’t like entering some beauty competition. And it never was. Certainly, some pretty handsome fellows have taken to the punch-up for fame and fortune, but if they ever worried about their looks excessively they were simply mugs who adopted the wrong occupation. Few of them ever got very far. What’s the commonest blow employed in boxing? I’d say, without hesitation, that it’s the straight left lead to the face. It doesn’t always land, but when it does it usually arrives with a plonk right on the schnozzle, and the poor old proboscis is the human feature which takes more than a bit of the brunt in most fistic exchanges. Consequently, just as most fighters seldom get through a career without sooner or later knocking up one or two of their knuckles, so very few manage all their days in this tough business without suffering a broken nose. In fact, the corrugated hooter is the trademark of the fighting man, and he can wear it like a badge of pride. It’s the boxer’s equivalent of the old soldier sporting the coloured medal ribbons across the left side of his waistcoat, and it’s far, far more evident than the bulbous and mis-shapen ear more usually connected with the so-called ‘cauliflower crew’. Unusual indeed is the fighter who avoids this occupational hazard. Although I do know quite a few boxers who never had a broken nose, I can’t think of many men who were so clever at all times that they did not suffer a solid shot to the nasal organ during their careers. One example was old James J. Corbett. He boxed some rough bangers in his day. John L. Sullivan, James J. Jeffries and Sailor Tom Sharkey were three. But he fancied himself as an actor more than as a boxer, and he made most of his money on the stage in those days well before multi-million dollar gates and world-wide television got a chance at this spectacle. He was one of those rare exceptions who did try to keep his features exactly the way Mother Nature had modelled them, and he did pretty well. 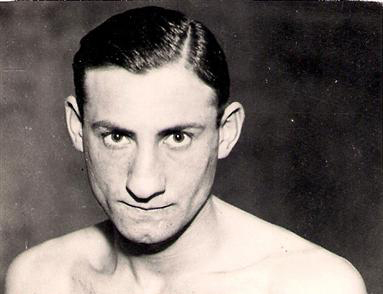 Bob Fitzsimmons took his title with the famous ‘solar plexus’ punch to the body, and Jim Jeffries clouted him to the canvas with a wallop to the jaw, but nobody ever got a solid swipe at the old Schnozzola. He retired absolutely unmarked. A year or so ago, I was chatting to two great professional fighters, both of whom I had always admired. The occasion was the 87th birthday party of dear old George Sewell – a good-looking bloke himself – and the father of Danny and George, Jnr. The chaps I was talking to were John Conteh, former light-heavyweight champion of the world, and Benny Caplan, one-time featherweight Southern Area title-holder, and foremost among our finest referees after he had retired from active competition. Close up, I was impressed by the fact that the Conteh profile was like that of a film star, and that he didn’t have an obvious mark on his face which could have betrayed his earlier profession. So I asked him if he ever had his nose busted, and he modestly admitted that he never had. Now, John was a very clever boxer, but he fought some hard battles, and he was lucky to get out of the game as ‘pretty’ as the day he went into it. That was at the old Ring, Blackfriars, back in 1935. A ten-rounder versus the featherweight champion of the world and one of the busiest and hardest-punching little southpaws who ever lived. “What do you think my wages were for that fight?” Benny asked me. I hadn’t a clue. “About a hundred quid?” was my suggestion, taking into consideration how long ago it had been. Over half a century ago he felt quite rich with that share of the purse. Shades of the featherweight purses for world’s champions now!